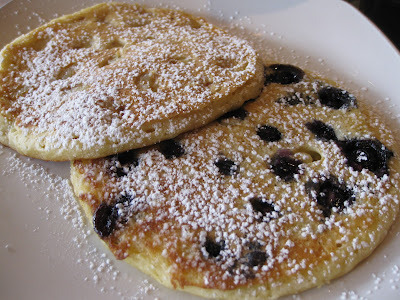 Vegan in Bellingham: Vegan Pancakes at Cafe Du Soleil: 1393 Commercial Drive, Vancouver B.C. Vegan Pancakes at Cafe Du Soleil: 1393 Commercial Drive, Vancouver B.C. One of the things Doug and I like to do when we stay in Vancouver is get up early and go for a nice walk around Stanley Park before going out for breakfast. The last time we did this, however, I ended up being way-more hungry than I had anticipated. Which meant that I spent much of our walk dreaming about the food I was going to consume as soon as we were finished. I rarely eat pancakes--maybe once or twice a year when I get a craving. And this particular day, I happened to have a HUGE craving. I actually became a woman-obsessed. The previous evening, we had already chosen where we were going to eat breakfast that morning, a cute-sounding place called Cafe Du Soleil, and the online reviews all sounded great. Unfortunately, when we clicked on their menu link, the only thing that appeared was the phrase "Something cool is coming soon." So of course, given my state of mind during our walk, I had one burning question: "Will they have pancakes?" It could have been partly because I was so hungry (and for whatever reason, so pancake-obsessed), but looking back at that morning now, I really feel like these were the best pancakes I ever had. The fruit was cooked right into the cake, and the pancakes were just the perfect combination of dense yet fluffy. The organic maple syrup was of course wonderful with these pancakes as well. As for the rest of the food at Cafe Du Soleil, I have a feeling it is pretty good. The place was crowded with happy-seeming diners who appeared to be enjoying their food, just like I was. I definitely intend to eat there again when I am in Vancouver. And the next time I get an extreme craving for pancakes, I know exactly where to go!